Peloponnese - seat of the Gods. 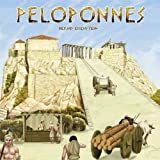 Each player represents one of 7 Peloponnesian civiliza- tions in 1000 B.C., trying to develop it, increase its wealth and population, and become the most powerful entering the new millennium. 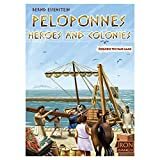 Only through a balance of inhabitants, land and buildings can a player claim victory and join the heroes of Peloponnesian history. With the help of Possession Markers, the Player Mats show all current possessions of that players civilization. Each player has a storehouse for wood, stone and food. In addition the total population and the number of the luxury goods are indicated. As soon as the possessions of a player changes, the appropriate track is adjusted. At the bottom of the Mat, there is also an overview of the events that take place at the end of the game. 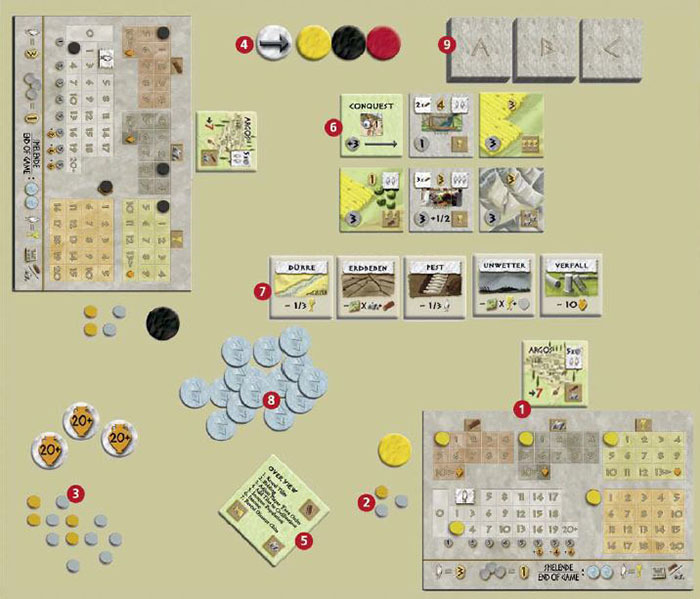 Each player also takes any Wood, Stone and Food listed on his Civilization Tile (upper right corner) by moving his Possession Marker on the appropriate track on his Player Mat. Each player also marks his starting population in the same way. Each player selects a color, takes the two matching Colored Chits and places them beside his Mat. One Colored Chit is to mark each player's color. The other is used to show the player turn order. 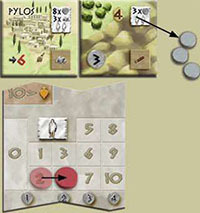 The first turn order is determined by the civilizations, with which each player begins the game. 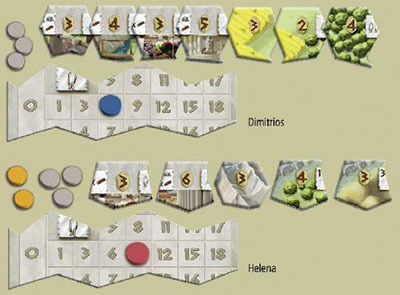 The player whose Civilization Tile shows the smallest number in the lower left corner is the starting player, and the other players follow according to their numbers. From the face-down Land/Building Tile stack, beginning with the "A" tiles, as many tiles as the number of players are drawn and placed face-up in a row. Then more tiles are drawn and placed face-up next to the Conquest Tile to form the "Conquest Row" until there are a total of 5 face-up tiles. If one of the tiles is a Supply Round (in the "B" and "C" stacks), the game is briefly interrupted: A Supply Round occurs (see Point 7), more Tiles are drawn and placed face-up until there are again a total of 5. Then the game continues. 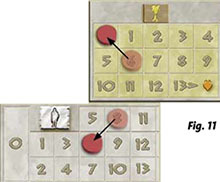 Starting with the player whose Colored Chit is next to the Arrow Chit, and following the player turn order, each player offers a bid on one of the face-up Land/Building Tiles in the middle. He takes any number of coins from his supply and places them, along with his other Colored Chit, under the tile he wishes to purchase (Fig. 4). As an alternative, the outbid player can take back his bid and all the coins in his bid plus 1 coin from the bank. He can no longer take a Tile this round. Or a player may pass without making any bid, in which case he receives 3 coins from the bank. The Land/Building Tiles in the Conquest Row each cost exactly 3 coins more than the minimum bid shown on tile. A player cannot be outbid on one of these tiles, however. The player who makes a bid in the Commando Row is guaranteed that tile. Example: a player wants a Land Tile from the Conquest Row. The tile shows a mini- mum bid of 3 coins. The player places 6 coins on the tile together with his Colored Chit. He is now guaranteed this tile. (Fig 6). When all players have a bid on a tile, have taken back their bid, or have passed, this phase is over. The new player turn order is determined by the amount each player bids. The highest bidder is the next starting player, etc. (the Colored Chits next to the Arrow Chit are reordered accordingly). If several players have identical bids this round, the order of these players remains the same as in the previous round. Passing is considered the lowest bid possible. Simultaneously all players now takes their Land/Building Tile. All coins bid for the tiles are placed in the bank, and each player's Colored Chit is returned to him. Building Tiles are placed left of a player's Civilization Tile (or the last Building Tile left of the Civilization Tile) to form a row. That player pays the appropriate amount of resources (wood/ stone), adjusting the markers on his Mat to build the building, if he can. If he cannot or does not wish to, he instead places one coin from his reserve onto the tile. In both cases, that player's population increases according to the Tile and the Building can be used immediately. If he does not have enough resources or a coin to mark the Building, the Tile is removed and placed back in the box. In the next Supply Round, each Building marked with a coin must be completed. This means that the player must immediately pay the appropriate amount of resources, and then return the coin back to his reserve. Land Tiles are placed to the right of a player's Civilization Tile (or the last Land Tile right of the Civilization Tile). Not every Land Tile, however, is allowed to be placed next to every other Land Tile. Neighbouring Land Tiles must always have at least one resource - wood, food or stone (lower right corner) - in common. Note: the first Land Tile to be placed directly next to the Civilization Tile may be any type. If a player cannot immediately place his Land Tile in this way, it is removed and placed in the box. The Player receives any new inhabitants and/or one-time income (usually coins) from the newly acquired tile. He may keep these, even if he later loses the Building. He adjusts the population Marker and other Markers on his Mat for any one-time in- come, and takes coins from the bank equal to the amount shown on the Tile. 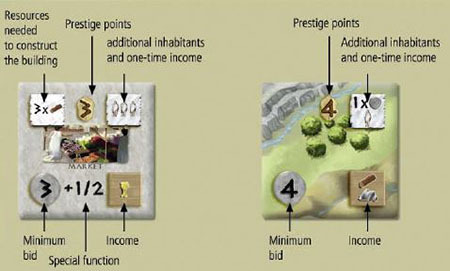 The income a player receives each round is shown in the lower right corner of each Land and Building Tile in a player's civilization. Players adjust the Markers on their Mats to record the additional resources, and take any coin income from the bank, adding it to their reserves. Coin Income is dependent on the size of the population (for example, a player with 10 inhabitants earns 4 coins). Note: Arkadia gains additional inhabitants each round, as part of its income. Its population is always adjusted bef++ore taking its Coin income. At the end of each round two Disaster Chits are turned face-up, one after the other, and placed next to their matching Disaster Tiles. If the blank Disaster Chit is revealed, it is placed back in the box. A disaster occurs immediately as soon as the third Disaster Chit of one type is revealed. Then a new round is begun, five new Land/Building Tiles are draw and placed face- up, and the starting player makes the first bid. A total of 8 rounds are played in the game: 3 rounds with the "A" Tiles, 3 rounds with the "B" Tiles, and 2 rounds with the "C" Tiles. 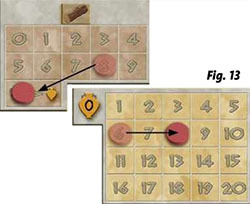 Each player must immediately give up one wood and one stone (by adjusting the Marker on his Mats) for each Building Tile in his civilization (including those that are incomplete and marked with a coin). If a player cannot or does not wish to do this, he must remove each building not covered, returning them to the box. For example, if a player cannot pay 2 stones, 2 buildings must be removed from her civilization. If a player cannot pay 1 wood and 1 stone, only one building must be removed. Each player immediately loses one-third (rounded up) of his food (adjust the Marker on the Food track). Each player immediately loses one-third (rounded up) of his inhabitants (adjust the Marker on the Mat). 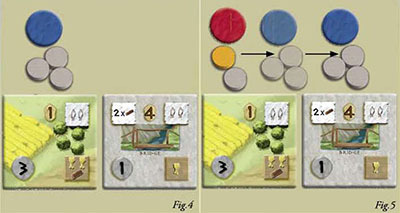 Each player must immediately give up one food (by adjusting the Marker on his Mat) and one coin from his reserve for each of his Land Tiles. If a player cannot or does not wish to do this, he must remove any Land Tiles not covered, returning them to the box. 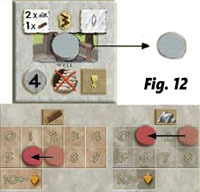 For example, if a player cannot pay 2 food, she must remove 2 Land Tiles. If a player cannot pay 1 food and 1 coin, only one Land Tile must be removed. Each player immediately loses 10 Luxury Goods (by adjusting the Marker on his Mat). If a player does not have that many, he simply loses all Luxury Goods. Certain Buildings offer protection against each disaster. If a player has built one of these buildings (marked or not marked with a coin), he is protected against the effects of that disaster. Pay the amount of raw materials needed to complete any building, which is marked with a coin. Each Inhabitant requires one unit of food. Each player adjusts the Food Marker on his Mat accordingly. A player may not intentionally starve his population if he has enough food. He must feed as many of his inhabitants as he can until they are all fed, or until his Food Marker is at "0". Each Building marked with a coin must also now be completed by pay- ing the necessary amount of resources (and recording it on his player Mat). (Fig- 12). If a player cannot or does not wish to pay the resources to complete a Building, the tile is removed and placed back in the box. In any case, the coin used to mark the Building is returned to that players reserve. Luxury Goods are gained by the overproduction of resources. 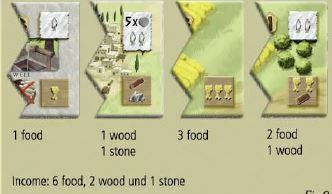 When a player receives an income of resources that is more than his storehouses can hold (a maximum of 10 Wood, 10 Stone, or 13 Food on the Player Mat), the additional resources are recorded as Luxury Goods on the player's Mat. Example: Leonidas has 8 Wood and produces an additional 4 Wood. He moves the Wood Marker on his Mat to the maximum number of 10, and then increases his Luxury Goods by 2. If a player's Marker on the Luxury Goods surpasses the "20" space, that player takes a "20+" Chip and begins again on the first space on the track. When a player has 14 or more inhabitants, he also receives Luxury Goods as income in addition to the coin income, as shown on the Player Mat. A player may, at any time, substitute Luxury Goods at a rate of 2:1 for any other resource (Stone, Wood, or Food). This is only allowed, however, when he does not have enough of the required resource for building or feeding. Luxury Goods may also be traded 2:1 for coins from the bank in order to make a bid or to place a coin onto an incomplete Building Tile. This is only allowed, however, when a player does not have enough money in his reserve. As soon as the last "C" Tile is taken and placed (and one-time income from the Tile is recorded) the end of the game is signalled. The last two Disaster Chits are revealed, one after the other, and any disasters resolved in order. Then each player must feed his population one final time (and reduce the population if there is not enough food) and pay resources for any incomplete Buildings or remove them. Population Points: 3 points for each inhabitant. The smaller amount of points (Prestige vs. Population) is the player's final score. If there is a tie, the tied player whose larger amount of points (Prestige or Population) is best wins. If there is still a tie, the tied player with the most Luxury Goods wins. Example: Dimitrios has a total of 25 Prestige Points from his Building/Land Tiles and coins, but only has 6 inhabitants (=18 Population Points). His final score is 18 points. Helena has only 22 Prestige Points from her Building/Land Tiles and coins, but has 9 inhabitants (=27 Population Points). Her final score is 22. 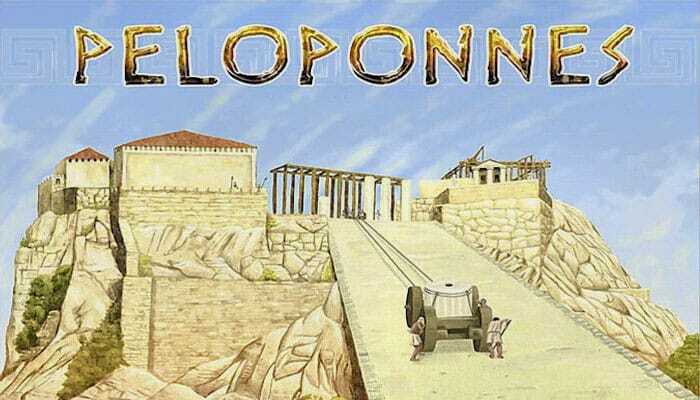 You can also play Peloponnes alone, in order to learn the flow of the game and optimize the different elements. The player chooses any civilization to start and uses the rules for the 5-player game (5 new Tiles each round without the Conquest Tile). The goal is to score the most points possible. Instead of bidding, a player simply purchases one face-up Land or Building Tile each round for the price listed as the minimum bid.